WE’VE won the battle – now let’s win the war. That’s the response of campaigners who swung into action last month when they heard that Stoke Lane was to be shut to northbound traffic for a year. They have persuaded the team behind the £200m MetroBus network to delay the proposed closure for a month and they are hoping to convince them to keep the road open for two-way traffic from Frenchay Park Road to UWE throughout the work, or at least to keep the one-way restriction to a much shorter time. People living in the area were horrified when they heard of the one-way proposals, which were not part of the original scheme. Traffic is due to be diverted via the Avon Ring Road, forcing some people to make a three-mile detour. Residents pointed out that banning traffic going up the hill would severely affect the time it would take thousands of people from Fishponds, Frenchay, and Downend to get to school, college or work in Bristol’s north fringe. They were also angry that the proposal to bring in the one-way restriction on April 24 was announced at less than two weeks’ notice. After more than 1,000 people signed Stoke Lane Action group’s petition against the closure, Bristol Mayor George Ferguson stepped in and suggested delaying the closure for a month. This was agreed by Bristol and South Gloucestershire Councils and their contractors Alun Griffiths. They said this would make it easier for students at the University of the West of England to ensure they arrived on time to sit their exams. The closure is still set to go ahead from May 22, but the action group has met the MetroBus team and talks are continuing over whether closing the route to northbound traffic is the least bad option. It is also hoped that the impact of the closure can be reviewed after a period of time. The MetroBus team has also agreed to review bus provision urgently and look at possible solutions around allotment access, mud on the road and provision for cyclists. 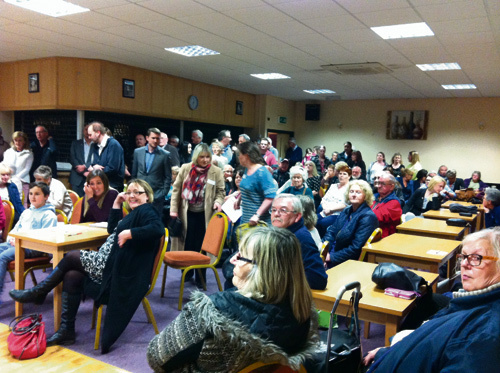 All these and other related issues were raised at an open meeting organised by the Stoke Lane Action group at Begbrook Social Club on April 19, which was attended by about 200 people. MetroBus was not represented, but Duncan Venison, from Bristol City Council highways department, answered some queries. Neil Collard, Amanda Vinall and Fiona Gleed explained how they had set up the group, organised the petition, a Facebook group and a website in a matter of days because they were fed up that residents were not being listened to over the MetroBus works. “What made us angry was the lack of consultation – the fact that it was a given and we could do nothing about it. We said ‘enough is enough’,” said Mrs Vinall. The meeting heard that the closure was to enable the contractors to build a retaining wall alongside the new bus lane. If the road remained two-way, with traffic lights, it was estimated that the work would take 37 weeks longer and cost £1million more to complete. Mr Venison said he had originally been against a one-way system but had been persuaded after seeing modelling of the impact on traffic patterns. However, the action group intends to challenge some of the models, which members think are based on out of date information. Residents say that the Avon Ring Road is already gridlocked, even before Stoke Lane is closed northbound. More than 2,500 people have now signed the petition, which means that both South Gloucestershire and Bristol councils will be obliged to consider it. MetroBus is a new bus rapid transport system for the West of England, designed to better connect areas of the city and reduce journey times. It is estimated that travelling from UWE to the city centre will take 15 minutes instead of the current 27 minutes. The work to create a bus lane at Stoke Lane is part of the North Fringe to Hengrove route, which extends from Emersons Green and Cribbs Patchway to south Bristol. It includes bus lanes, a bus-only junction at the M32 andr other infrastructure measures. It is due to be opened in autumn 2017.